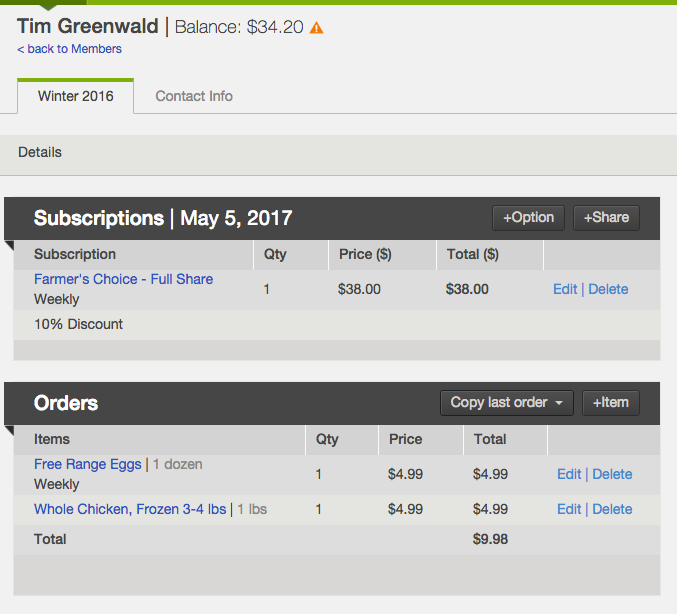 Enabling the Recurring Store Orders will allow members to sign-up to receive web store add-ons on any schedule you have available for the item. The member can update the item or remove it from their order at any time, giving them more flexibility and making it easier to shop from your store. 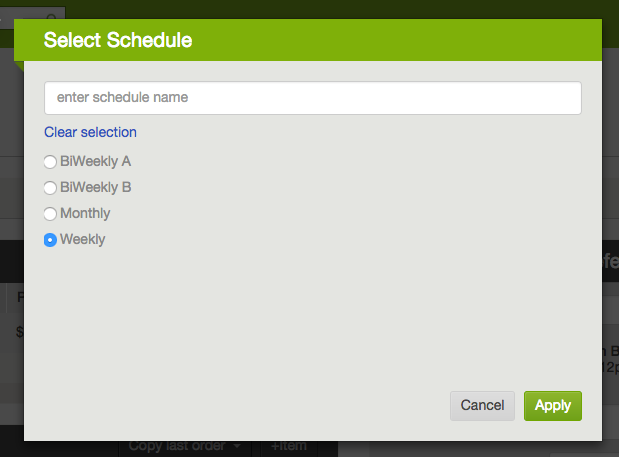 Recurring Store Orders are only compatible with the store settings BALANCE and On Delivery. Learn more about Store Checkout Here or contact Support for more information. Once Recurring Store Orders is enabled and you have verified your payment settings are compatible, you are ready to select which schedules the recurring store orders will use. Click on an individual schedule to enable for store items, then click edit, check the box for "available for store items" and save changes. How Do Members Add Items as Recurring? 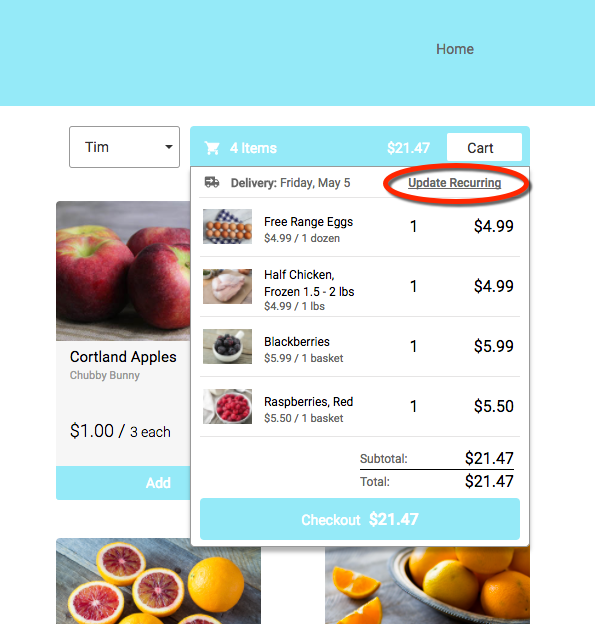 Once the setting for recurring orders is active and the schedules are selected in the dashbaord, the store is ready to accept recurring web store orders. Members are given the option to purchase items once, or on any of the active recurring schedules. 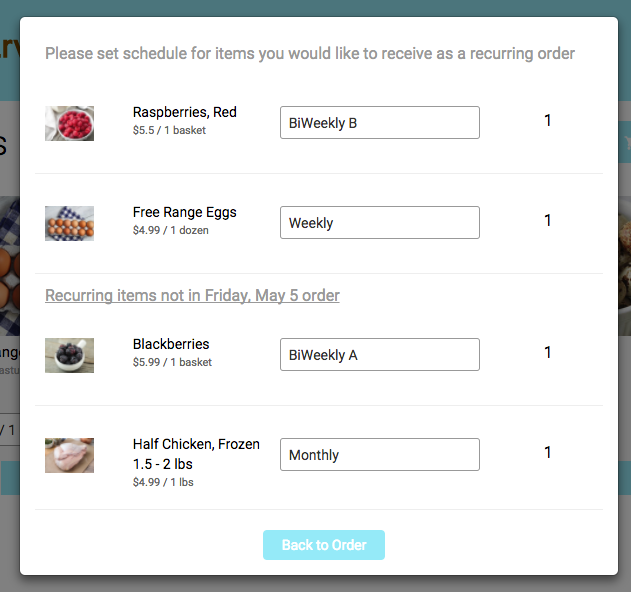 When the member clicks on the shopping cart, they can click the option to "Update Recurring" and select the schedule for each item in the cart. The system will note which items will be set for the future, and which orders are for the current delivery date. Then the member will checkout with any items that are set for the next active delivery date. You can also add any store items as a recurring from the member card in the dashboard. First, open the member's account by typing their name in the search bar. Click +Item to add items to their next order. For items they would like to receive on a recurring schedule, click the link to "Make Recurring", select the schedule, and click "Apply". Any items that are not designated to a schedule will be received on their next active delivery date, listed under their name. Items set with a recurring schedule will be added to reports for their applicable delivery date. Learn more here.